At the time, I didn't own an e-reader. I had the Kindle app on my phone, which is useful for those times when you're stuck in a waiting room and don't have a book with you. The iPhone is not an ideal reading device, but the app is well designed, the text is legible, and it has a sort of automatic bookmarking feature, so you never lose your place. I like that. Now, I have always liked, and continue to like, physical books. I particularly like them well-made, with sewn bindings, smooth heavy paper, carefully chosen typefaces, and beautiful covers. Many of the things I want to read don't come in the form of beautiful physical books, though, or if they do, they're prohibitively expensive. I don't feel any particular attachment to cheap and nasty paperback bindings filled with equally cheap and nasty woodpulp paper. And, furthermore, magazines. I like the content of certain magazines very much (Smithsonian and National Geographic, for example), but one of the ugly realities of life in The Belfry is that we are constantly waging war against paper. Subscribing to magazines is tantamount to inviting a beseiging army into the city, serving them tea and finger sandwiches, and then being surprised when they start running their own flags up the poles. So last summer, as my birthday present to myself, I bought a Nexus 7 tablet and installed the Kindle app on it. (I installed a bunch of other apps, too, but that's another story). Now I can read almost every magazine I want, without worrying that I'll wind up trapped in a fortress of glossy paper. 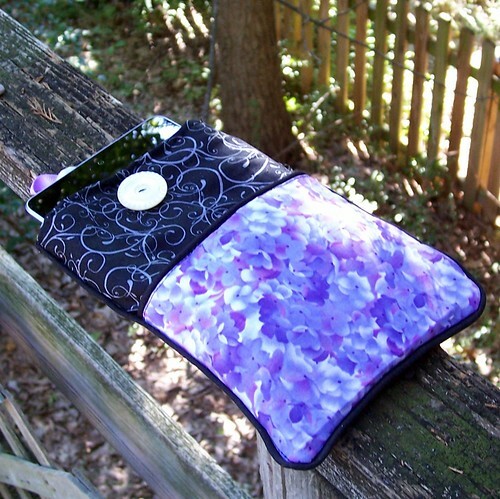 You can buy cases for the Nexus 7, or any other tablet you may happen to have, but I opted to sew one instead. I thought ever so briefly about knitting one but decided I'd be more likely to finish sewing one. A knitted one will come another time, perhaps. What I found I really liked about making a cover, instead of buying one, was the opportunity to make something that didn't look like every other pleatherette tablet case out there. Inspired by the oilcloth iPad sleeve on the blog Always A Project, but with measurements adjusted to fit the Nexus 7. Materials: 3 fat quarters, a button, one package of piping, 6 inches of ribbon, and a scrap of quilt batting. Total cost about $13, but that included a whole spool of ribbon and a 1-yard remnant of batting, much more than I needed for this. 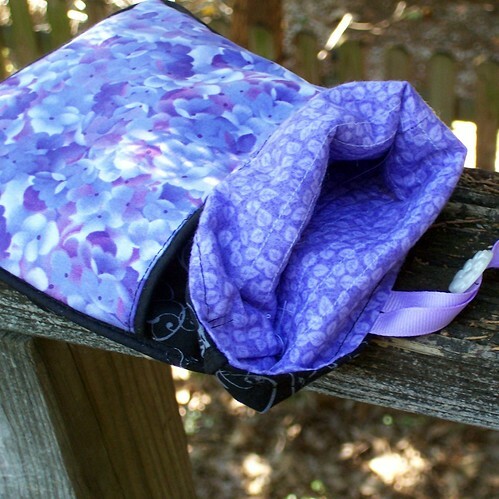 You could probably make this with only two fat quarters but I wanted both lavender prints. The pocket in the front holds the USB cable and AC adapter. I quilted the lining to provide a little padding. The black and grey print for the body was selected because it reminded me of calligraphy, but a clever needleworker might use appliqué or embroidery to imitate a favourite jacket illustration. The challenge of course would be to select just one jacket to reproduce. Might I suggest Arthur Hawkin's 1932 cover for Faulkner's Light In August as worthy candidate?